Chow has committed to keeping property taxes, which account for about 40 per cent of the City’s total revenue, “around” the rate of inflation. What this means has been the subject of debate and speculation on the campaign trail, and she has committed herself to no more than 3 per cent a year. Chow also promises to use the 1.6 per cent Scarborough property tax increase to fund the Downtown Relief Line, provided she can get matching commitments from the federal and provincial governments. But she has also committed this money to other projects, including the TTC’s state-of-good-repair backlog. She also pledges to increase the land transfer tax on homes sold for more than $2 million. This promise would affect roughly 500 households a year, and the campaign projects that it would raise about $20 million in additional annual revenue. The Chow campaign argues that this would constitute a more progressive form of taxation—and pledges that the money generated would be directed to issues that have been prominent planks of her platform: transit, children’s programs, and environmental projects. In keeping with her desire for progressive taxation, Chow has referred to Rob Ford’s move to increase user fees as “shameful,” and says she will try to reduce them as mayor. She has not put forward a plan indicating how she would offset the revenue if they were to be reduced or issued a specific reduction target. Chow also proposes to tax polluting companies on a cost recovery basis and to use the resulting $3.5 million to support her tree canopy proposal. She also plans to extend the City’s small-business tax reduction program until 2020. The program is currently set to expire in 2015. Chow has ruled out additional revenue tools. Since his late arrival into the campaign, Doug has adopted much of his brother’s platform. In August, Rob pledged to keep property taxes “well below” the rate of inflation. This may prove difficult. Next year’s budget assumes a property tax increase of 2 per cent, as well as a TTC fare hike and other revenues, and still presents the City with a sizeable revenue gap. Ford vows that his first act as mayor would be to cut the land transfer tax by 15 per cent and that he would then introduce additional 15 per cent cuts each year. Like the property tax promise, this may also prove difficult to make good on. Rob promised to repeal the entire land transfer tax in his 2010 campaign, but once it was clear that that would be impossible, he unsuccessfully sought to reduce the tax by 10 per cent and then 5 per cent. While Doug Ford does not have any specific campaign policies related to user fees, he supported user fee increases over the past council term—part of a broader trend post-amalgamation that has seen the City shift more of the revenue burden to fees in order to alleviate property taxes. Doug Ford’s transit plan [PDF], the first phase of which he claims can be built for $9 billion, is based on several vague funding tools. Among the nine options he proposes are TIFs, money from other orders of government, and public-private partnerships. While his brother proposed a less extensive transit plan in 2010 and had the same funding options available to him this term, he and Doug were obliged to vote for a 1.6 per cent property tax increase for the three-stop plan. Other proposed funding sources for his transit plan include Build Toronto’s asset sales—projected to be worth $540 million. However, a City spokesperson told NOW Magazine that $445 million of the $540 million has already been earmarked for other projects. 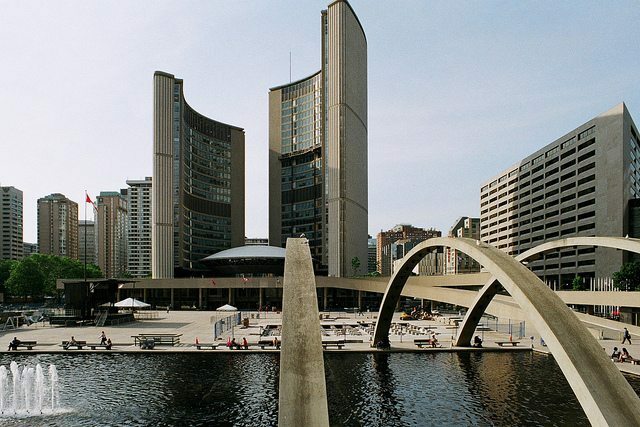 Ford has repeatedly voted and argued against new revenue tools for the City. Tory promises to keep property taxes “within” the rate of inflation, which is expected to be about 2 per cent. He pledges to continue with the Scarborough subway proposal, which would add 0.5 per cent to the property tax revenue increase in 2015 and another 0.6 per cent increase in 2016. Tory has stated that the City can’t responsibly repeal or reduce the land transfer tax without a corresponding revenue increase or service decrease elsewhere. He does not have any plans to change the land transfer tax, which brought in $357 million in 2013. In recent years, the land transfer tax has represented the difference between a surplus and deficit. Tory also supports keeping development charges as is. Tory promises to keep sports user fees flat. Between 2011 and 2013, parks and recreation user-fee revenue increased by 23.1 per cent. Much of Tory’s platform relies on increased funding from the federal and provincial governments, and he has said he will “shame” them into paying their fair share and that “there will be hell to pay” if they do not. He frequently argues that he is the candidate best positioned to negotiate with the provincial and federal governments. Tory has also not specified how his tree canopy and cycling plans would be funded. Tory has ruled out additional revenue tools.